UOregon is the official iPhone and Android app of the University of Oregon. 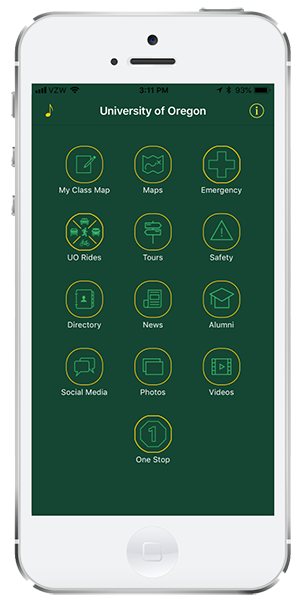 Using the latest innovations in mobile mapping technology, the UOregon app will route you around campus as well as indoors, helping you find classes, transportation options, safety information, take tours and explore the 295-acre Eugene campus through feeds of photos and videos as well a host of unique maps. The app was developed by students and staff in the Campus GIS & Mapping Program in conjunction with the Office of Digital Communications. My Class Map - see your course schedule, mapped to the classroom! Safety - links to UOPD, Emergeny Management, Safety videos and maps.